Frederick II was the son of Emperor Henry VI of the Hohenstaufen dynasty and Constance d’Altavilla daughter of Roger II founder of the Norman monarchy of southern Italy. Frederick was born in Jesi, a town of the province of Ancona in the Marches, on December 26th, 1194 (the day after Christmas). He grew up in Umbria, in Foligno, not far from Assisi, where he remains until the age of 3 years. 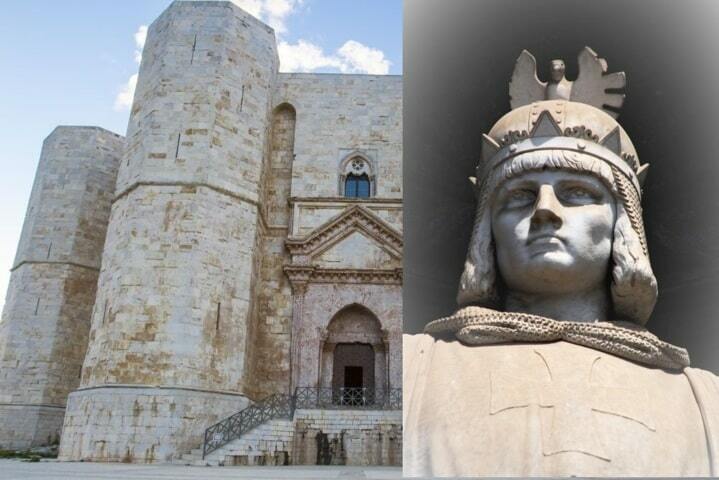 And it is in Foligno that he is baptized receiving the name of the two grandparents: Frederick, like Barbarossa, and Roger, as the founder of the Norman monarchy. As a result, it is during this event that Henry VI sees his son for the last time. In fact, the emperor died in September 1197 in Sicily, where he returned to stop the umpteenth revolt of the local nobility. The young Frederick is then taken to Sicily where his mother Constance was waiting for him. For fifteen years, until 1212, he lives in the Norman Sicily, a land in which four different communities for religion, language and culture were able to coexist without too many frictions: the Muslims, the Jews, the Latin and Greek Christians. A harmony between the communities that made Palermo a city of extraordinary cultural and intellectual vivacity. And it is with these communities that the young Frederick grows feeding on the cultural eclecticism of the Norman capital. His linguistic knowledge dates back to the Palermo stay; He was fluent in German and Italian, and he had a good command of Latin, Greek, and Arabic. In the city, there was no shortage of intellectual people, able to start Frederick to the fundamental techniques for his future activity, as well as to the taste of philosophical and scientific speculations. Cultivated throughout his life, this knowledge strongly distinguishes the personality of the Swabian emperor against all the other sovereigns of his time. Unfortunately, the mother dies just over a year after arriving in Sicily. So he was alone during the disorders that flared in the Norman Italy at the death of a prince. The son of Henry VI and Constance, Frederick II was the rightful heir to the kingdom founded by his grandfather Roger II and recognized by the Pope. So, no one dared to challenge his crown right within the kingdom. And starting from 1208, the Pope supports Frederick to recover the rights usurped during his minority. Also in 1208, the year of his fourteenth birthday, Frederick proclaimed himself an adult and began a feat that commits him for over twenty years: the recovery of all the rights and assets of the Norman monarchy. Meanwhile, in 1209 Pope Innocent III crowns the Saxon Otto IV of Brunswick emperor of the Holy Roman Empire. But just crowned, Otto radically changes politics by denying the recognition of the rights of the pope on the lands of central Italy. As a consequence, he is deposed and excommunicated by the pope in 1210. Otto IV starts preparations for the conquest of southern Italy gaining the consent of many lords and cities of the region. In mid-1211, the situation for Frederick seems desperate, but the intervention of the King of France reverses the danger to the detriment of Otto. He, therefore, decides to renounce the invasion of Sicily to restore order to the Empire due to the rebellion of the German princes supporters of the Hohenstaufen. And also to tame the uprising of many cities in northern Italy. In 1211, at less than 18 years, Frederick left Sicily to reach Rome where Pope Innocent III proclaimed him Emperor of the Holy Roman Empire. Hence he goes to Germany to obtain the imperial authority conferred on him by the princes. With the help of the king of France, Philip Augustus, he defeated Otto IV, obtaining the accession of a growing number of feudal lords and German cities. It is crowned emperor with all the solemnities of the rite in Aachen, the ancient Carolingian capital. In 1218 Frederick II was the undisputed ruler of the Kingdom of Sicily and of the Holy Roman Empire, to which he was crowned by Pope Honorius III in Rome on November 22nd, 1220. After 8 years in Germany, in 1220 Frederick II returned to Italy where he remained for almost his entire life. He establishes his kingdom in Sicily, an island well known for its economic and cultural wealth. A territory that has experienced a cultural vivacity of a society where the cohabitation and the relationships between the different religious communities had created the conditions for an intense artistic and intellectual flowering. Immediately after the coronation, Frederick II starts to work into his reign in order to restore the prerogatives of the monarchy. Among the various laws promulgated, three major reform complexes have helped to create a new model of State that places public life under the control of the sovereign. As a first intervention, he hits the barons regulating the feudal system in such a way as to totally subjugate it to the royal authority. He improves and expands the fortification system by dedicating particular attention to the maintenance and equipment of the kingdom castles. Together with the Barons, Frederick hits the Muslims of Sicily with harsh repression. This persecution does not take place for religious but political reasons. In fact, this community grouped mainly in the eastern part of the island constituted an autonomous region in open rebellion against the monarchy. This clash ends with the mass deportation of surviving Muslims in Apulia. Since 1223, they occupy Lucera, an ancient Byzantine colony in the province of Foggia. Frederick gives them the faculty to preserve their religion and live according to their customs. The second intervention was completed in 1231 with the promulgation of one of the most grandiose legislative monuments of the Middle Ages: the Liber Augustalis, the Constitutions of Melfi (a town in Basilicata). For Frederick, the authority of the sovereign does not admit any form of control or limit. This claim will end up constituting the most profound reason for its conflict with the Papacy. Like the Roman emperors, he claimed the faculty to create the right, to be himself the living law on Earth. The third intervention focuses on consolidating relations with the powerful lords of Northern Italy, mainly located in Veneto and Emilia Romagna regions. Although with the irreducible opposition of Milan and the Lombards, Frederick will find faithful supporters and precious allies in the Italian Municipalities. This is the period in which in every city there is a party supporting the emperor that only from the last years of the reign of Frederick will take the name of Ghibelline. While his adversaries will be called Guelphs, supporters of the Pope. The pope did not accept that the temporal power was in the hands of Frederick and that the church should deal only with its spiritual mission. In 1239, Pope Gregory IX proclaims for the first time the crusade against a Christian prince. His strategy was based on arousing the horror of the Christian masses against the sovereign. Under Innocent IV (1243-1254), the struggle against the emperor underwent a turning point in favor of the pope. As already lived 150 years before with the charismatic figure of Matilda of Canossa, the church focuses on women by relying on the devotion of the female public to the Virgin Mary. Therefore, always in the forties, The church also worked to win the trust of the plebeians fighting against the political and fiscal privileges of the nobility. These were the revolutionary choices that contributed to the decline of the empire of Frederick II. Unfortunately, in the autumn of 1250, the emperor was struck by a violent attack of dysentery that led him to death on December 13, 1250, at 56. His corpse is taken to Palermo where it rests in the cathedral, next to that of his first wife Constance of Aragon.